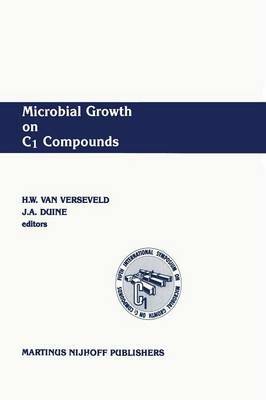 The 5th International Symposium on Microbial Growth on C Compounds was held at the Biological 1 Center of the University of Groningen, Haren, The Netherlands, 11-16 August 1986. The meeting attracted well over 200 participants from 15 countries. This volume contains the formal presentations made at that time, which, because of the breadth of topics covered, were divided into seven sections of related papers. This meeting, under the chairmanship of Wim Harder, was both scientifically and socially very successful. This success cannot only be credited to the main presentations, but also to the well cared- for 121 poster presentations, whereof the abstracts have been published separately. The series of Symposia will be continued in 1989, in the Federal Republic of Germany. We wish to acknowledge the invaluable help of Joke Daniels, Roberta Stroer-Schneider, Karin Uyldert, Hansje Bartelson and Josine van Verseveld-Stroer, who retyped the manuscripts resulting in a uniform presentation of these proceedings.